© 2017 Nguyen and Frydrych. Oral leiomyomas are rare, benign neoplasms of smooth muscle origin, presenting as a solitary, asymptomatic, nodular mass. Here we present the case of a 54-year-old male with a lesion in the midline of his hard palate, which was diagnosed as a localized benign leiomyoma, along with a review of the recent literature. Diagnosis of a leiomyoma must be based on the histopathological assessment of tissue as the clinical appearance is non-specific. The peak prevalence of head and neck leiomyoma is observed in the 4th and 5th decade of life with uncertain gender predilection. Histological features include interlacing fascicles of smooth muscle small cells with eosinophilic cytoplasm. Complete excision is usually curative and recurrence is rare. Due to their rare nature, it is important that cases of oral leiomyoma can be reported in the literature to improve our understanding of this entity. Keywords: Oral Leiomyoma, Hard Palate, Benign neoplasms, Histopathological assessment, Eosinophilic cytoplasm, Interlacing fascicles. A leiomyoma is a circumscribed, benign tumor composed of intersecting bundles of mature smooth muscle cells, occurring most frequently in the uterine myometrium, gastrointestinal tract, skin and the lower extremities . The most common sites for leiomyoma are in the uterus, with about 95% involving the female genital tract, followed by skin [2-4]. As the oral cavity is bereft of smooth muscles except in blood vessel wall, this tumor is rare in the head and neck region with reported incidence of 0.065 to 1% [4, 5], accounting for 0.42% of all soft-tissue neoplasms in the oral cavity . A review of the literature by Leung and Wong in 1990 yielded only 124 cases reported from 1884 to 1987 . Oral leiomyomas can appear at any age, however its peak age of incidence is between 40 and 49 years of age, with over 65 percent being found in patients older than 30 years of age . Currently, the presence of any gender-specific predilection is not clear [2, 3, 7]. Leiomyomas are generally asymptomatic, although tumors can occasionally become painful. The diagnosis is mainly determined by histological studies due to their non-specific clinical appearance . Typically, a solid leiomyoma presents as a slowly enlarging, asymptomatic, firm, submucosal mass, with a greyish or bluish tone . The colour of the lesion may also be similar to the adjacent mucosa . The lesion is smooth and rarely ulcerates . The size of the lesion may range from a few millimetres to several centimetres . The World Health Organization (WHO) classifies leiomyomas into three histological types: solid leiomyoma (25%), vascular leiomyoma, also known as angioleiomyoma or angiomyoma (74%) and leioblastoma, also known as leiomyoblastoma or ephitheloid leiomyoma (1%) [3, 10, 11]. 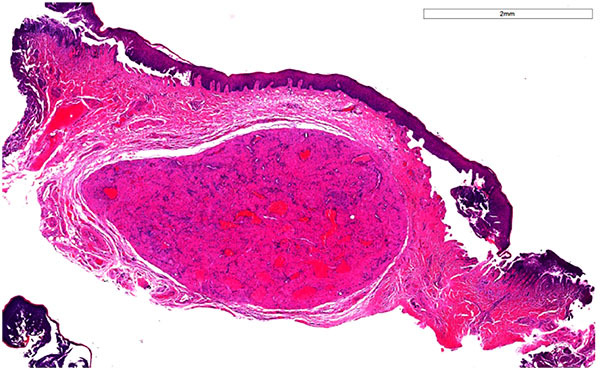 According to Damm and Neville, a solid leiomyoma is histologically very different from angioleiomyoma, and the two entities should therefore be regarded as separate tumors . We hereby present a case of an oral leiomyoma involving the hard palate and a literature review. A 54-year-old male patient presented with the chief complaint of an asymptomatic swelling in the midline of his hard palate, which he first noted about 2 months prior. The patient was not aware of any other oral mucosal problems. His medical history was essentially non-contributory. He suffered from allergic rhinitis and was taking systemic antihistamines and using a mometasone furoate nasal spray. He was a non-smoker but reported a brief past smoking history. Intraoral examination revealed the presence of a discrete, raised, mid-palatal ovoid lesion with a bluish appearance, measuring 6mm by 4mm. Subtle reticular, erythematous lesions were also noted to affect the gingiva and the left buccal mucosa. These reticular, erythematous lesions involving his gingiva are shown in (Fig. 1a). No other abnormalities were identified. Extraoral examination was unremarkable. Fig. (1a). Reticular, erythematous lesions involving the maxillary and mandibular gingiva. An excisional biopsy was performed of the palatal swelling and a tissue sample measuring 12mm x 7mm x 4mm was submitted for routine histopathology. Fig. (1b) shows a post-operative photograph illustrating the site and extent of the excision. Fig. (1b). Post operative photograph of healed hard palate excisional biopsy. The histopathology report indicated that the lesion was a leiomyoma. Immunochemistry for S100 was negative and smooth muscle actin was strongly positive. Incisional biopsy of the left maxillary buccal gingiva indicated the presence of oral lichen planus (WHO diagnostic criteria). In view of the mucosal lesions, the patient was also referred for a series of routine blood tests to ensure the absence of haematinic deficiencies. Fasting glucose levels and the presence of anti-skin antibodies was also ascertained. All results returned within normal limits. 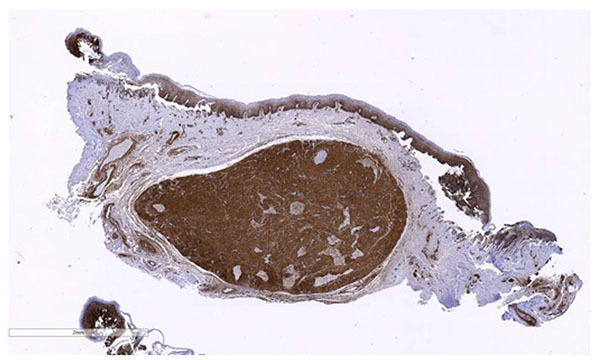 A well-circumscribed, encapsulated mass was visible within the subepithelial collagen, as seen in Fig. (2). This was composed of interlacing fascicles of smooth muscle with small angulated vasculature lined by a simple endothelium. No evidence of malignancy was seen. (Table 1) summarizes the histopathological features of a solid leiomyoma. Fig. (2). Mass of smooth muscle with small angulated vasculature. H and E, ×40. Table 1. Solid leiomyoma histopathological features . Occasionally leiomyomas have a prominent fibroblastic or myxoid component. Immunohistochemically, leiomyomas are reactive with vimentin, desmin, α-smooth muscle actin (SMA), and muscle specific actin . Desmin, actin, H-caldesmon and vimentin are diffusely and strongly positive in the neoplastic cells  Most tumor cells are also positive for smooth muscle actin and Myoglobin. The Ki-67 index is usually >5% . The immunohistochemical technique is an important aid in diagnosis, in which these tumors usually express immunoreactivity for SMA and negativity for the S-100 protein. In this case, as seen in Figs. (3a and 3b), immunochemistry for S100 was negative and smooth muscle actin was strongly positive. Fig. (3a). Lesional tissue showing positivity for smooth muscle actin. Fig. (3b). Lesional tissue showing negativity for S100 (IHC, ×40). 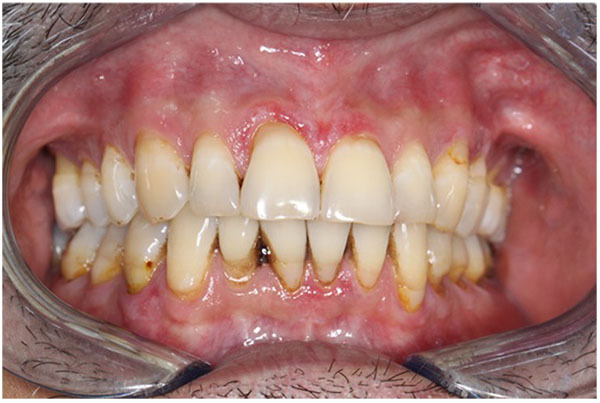 The diagnosis reached from his left gingival biopsy was oral lichen planus (OLP). Direct immunofluorescence was performed and revealed no diagnostic features. To the best of our knowledge, this is the first case of concurrent OLP and leiomyoma in the same patient. Given that OLP is a common oral mucosal disease, the association is likely a coincidental one. The diagnosis of a leiomyoma must be based on the histopathological assessment of tissue as leiomyomas cannot be differentiated from other mesenchymal tumours on clinical presentation alone. The differential diagnoses of an oral leiomyoma are summarized in (Table 2). Table 2. Differential diagnoses of an oral leiomyoma. Table (3) summarizes recent cases of oral leiomyoma as described in the available literature. Table 3. Other recent cases of oral leiomyoma. Montague et al 2013 (2 cases)  Nodular growth of unspecified duration. In addition to routine histopathology, immunochemistry may be an invaluable tool in ensuring accurate diagnosis. For example, a myofibroma can be distinguished by the central zonal phenomenon with vimentin and SMA stains, while a hemangiopericytoma does not present with lesional cells arranged in long bundles or fascicles, and is negative for smooth muscle-specific antibodies . Neural tumors usually stain positively for S-100 protein and neuron-specific enolase but not for desmin and smooth muscle actin . Of particular importance is differentiating leiomyoma from its malignant counterpart, a leiomyosarcoma, especially a low-grade leiomyosarcoma. The presence of mucosal ulceration should raise suspicion of malignancy. Histopathologically, the presence of mitoses is concerning. Lesions with 5 or more mitotic figures per 10 high-power fields should be considered to have malignant behavior, while fewer than two mitotic figures per 10 high-magnification fields are is indicative of a good prognosis (Gonzalez Sanchez) . Molecular markers such as PCNA, bcl-2, CDK4, p53 and MDM2, may be useful in differentiating benign from malignant tumours . Treatment of leiomyoma is surgical and excision is considered curative. There is consensus across the literature that recurrences are extremely infrequent. The patient was reviewed 1 year post excision with no recurrence. Oral leiomyomas are rare, benign smooth muscle neoplasms. Intra-orally, they tend to occur on the posterior portion of the tongue, palate, buccal mucosa, lips and salivary glands. Because of their relative rarity and non-specific clinical appearance, diagnosis may be a challenge. Diagnosis requires histopathological assessment, and the use of stains such as smooth muscle actin may be invaluable. It is important that cases of oral leiomyoma are reported in the literature to improve our understanding of this entity. Treatment is surgical and excision is associated with a very low recurrence rate. The author/s whose names are listed certify that they have NO affiliations with or involvement in any organization or entity with any financial interest (such as honoraria; educational grants; participation in speakers’ bureaus; membership, employment, consultancies, stock ownership, or other equity interest; and expert testimony or patent-licensing arrangements), or non-financial interest (such as personal or professional relationships, affiliations, knowledge or beliefs) in the subject matter or materials discussed in this manuscript as well as a publishable conflict of interest statement. Veeresh M, Sudhakara M, Girish G, Naik C. Leiomyoma: A rare tumor in the head and neck and oral cavity: Report of 3 cases with review. J Oral Maxillofac Pathol 2013; 17(2): 281-7. Gianluca S, Marini R, Tonoli F, Cristalli MP. Leiomyoma of oral cavity: Case report and literature review. Ann Stomatol (Roma) 2011; 2(1-2): 9-12. Sharma A, Goyal G, Panwar SS, Nangia R. Leiomyoma of oral cavity: A review. Ann Dental Specialty 2015; 3(4): 103-4. Baden E, Doyle JL, Lederman DA. 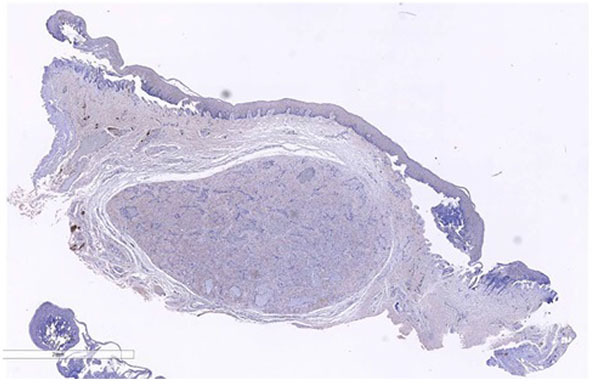 Leiomyoma of the oral cavity: A light microscopic and immunohistochemical study with review of the literature from 1884 to 1992. Eur J Cancer B Oral Oncol 1994; 30B(1): 1-7. Leung KW, Wong DY, Li WY. Oral leiomyoma: case report. J Oral Maxillofac Surg 1990; 48(7): 735-8. Dutt KC, Bindra S, Awana M, Talwar M, Lehl G. Intraosseous Leiomyoma of the Mandible: A case report of the rare entity and review of literature. J Maxillofac Oral Surg 2017; 16(2): 145-51. Kaur G, Gondal R. Oral leiomyoma. J Oral Maxillofac Pathol 2011; 15(3): 361-2. Glas E. Contribution to pathology of tongues. Wien Klin Wochenschr 1905; 18: 747. Luaces Rey R, Lorenzo Franco F, Gómez Oliveira G, Patiño Seijas B, Guitián D, López-Cedrún Cembranos JL. Oral leiomyoma in retromolar trigone. A case report. Med Oral Patol Oral Cir Bucal 2007; 12(1): E53-5. Fletcher C, Unni KK, Mertens F, Eds. WHO pathology and genetics of tumours of soft tissue and bone 2002; 128-34. González Sánchez MA, Colorado Bonnin M, Berini Aytés L, Gay Escoda C. Leiomyoma of the hard palate: a case report. Med Oral Patol Oral Cir Bucal 2007; 12(3): E221-4. Damm DD, Neville BW. Oral leiomyomas. Oral Surg Oral Med Oral Pathol 1979; 47(4): 343-8. Alvarez E, Laberry M, Ardilla C. Multiple oral leiomyomas in an infant: A rare case, case reports in dentistry 2012; 3. Gaitan Cepeda LA, Quezada Rivera D, Tenorio Rocha F, Leyva Huerta ER, Mendez Sánchez ER. Vascular leiomyoma of the oral cavity. Clinical, histopathological and immunohistochemical characteristics. Presentation of five cases and review of the literature. Med Oral Patol Oral Cir Bucal 2008; 13(8): E483-8. Nonaka CF, Pereira KM, Miguel MC. Oral vascular leiomyoma with extensive calcification areas. Rev Bras Otorrinolaringol (Engl Ed) 2010; 76(4): 539. Reddy B, Rani BS, Anuradha Ch, Chandrasekhar P, Shamala R, Lingamaneni K. Leiomyoma of the mandible in a child. J Oral Maxillofac Pathol 2011; 15(1): 101-4. Montague LJ, Fitzpatrick SG, Islam NM, Cohen DM, Bhattacharyya I. Extensively ossifying oral leiomyoma: A rare histologic finding. Head Neck Pathol 2014; 8(3): 311-6.